Declaration of Independence, by John Trumbull, commissioned in 1817. 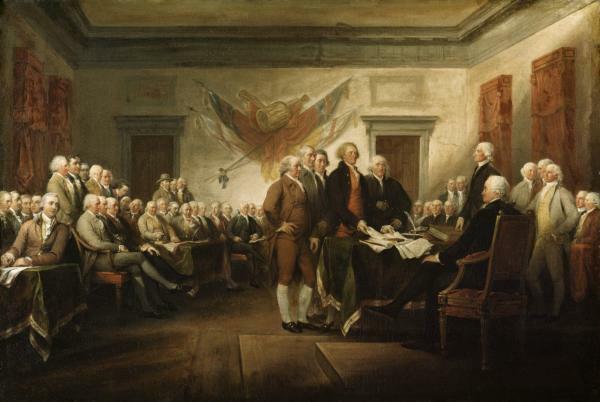 To "preserve the resemblance of the men who were the authors of this memorable act," painter John Trumbull tracked down and painted from life 36 of the 47 men portrayed in his "Declaration of Independence." The chamber, however, he based on a sketch that Thomas Jefferson gave to him in Paris in 1786. The 12-by-18 foot painting has hung in the United States Capitol Rotunda since 1826.